Meet Ashley at Homeward Pet today! Photo courtesy of Homeward Pet. Ashley has the purr of all purrs. She could win a purr-off contest! This lady has the loudest and most endearing rumble you ever will hear. 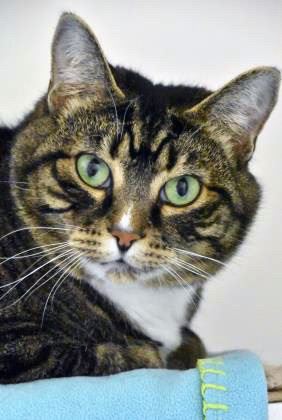 Ashley is about nine years old and the perfect mix of playful and affectionate. She loves to cuddle with her people, get cheek rubs and purr! You will never feel lonely when Ashley is around. This darling would like a quieter home with just teens and adults. Come bring home Ashley today!